Reports have come out that the UN was considering adding Israel to the list of “grave violations against children in armed conflict.” As detailed below, Israeli army and Israel’s state policies are systematically violent against Palestinian children. Even though the UN has historically not taken strong action against any of Israel’s war crimes over the decades, let alone those specifically against Palestinian children, Israel has reportedly exerted pressure to be de-listed from the draft list, with seeming success. Apparently, Israel thinks such call for its joining the list is “a heinous and hypocritical attempt to besmirch the image of Israel and it is doomed to fail,” Foreign Ministry spokesman Emmanuel Nahshon reportedly said. Further testimonies following the the July/August 2014 war on Gaza highlight the brutality meted out on Palestinians (including children). Having between November 2008 and March 2013 lived a cumulative three years in the Gaza Strip, including during two Israeli waged massacres of Palestinians in Gaza, I present three (of too many) cases of Israel targeting children, of which I have personal knowledge. 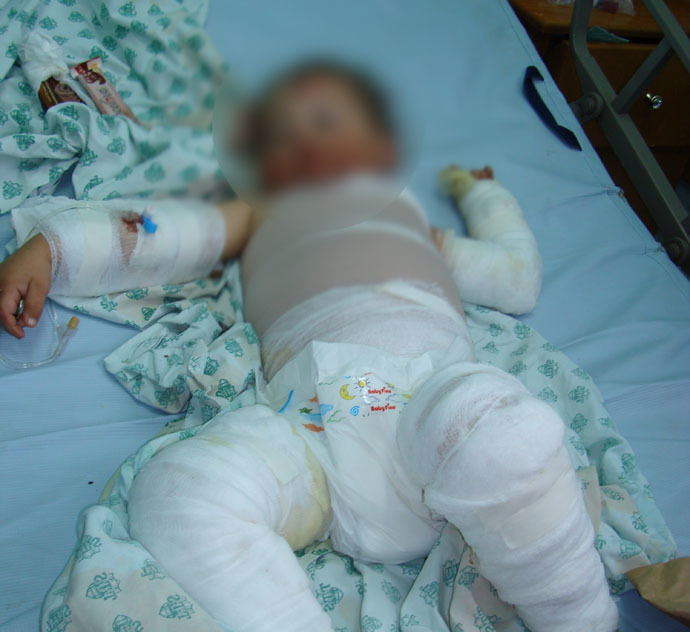 On November 21, 2012, a 14-year-old boy asked his father for 10 shekels, to go to the small store up the road to buy food for his siblings who hadn’t eaten anything but bread for the past five days of Israeli bombing. The bombing had not quite stopped, but Nader Abu Mghaseeb believed he was safe, a ceasefire due to be enforced in just under two hours. He was incorrect. Minutes after the precision drone strike hit Nader, his father rushed out to find the dying, tangled mass of flesh that had been his son. Two years and many Palestinian child martyrs and maimings later, during the July/August 2014 Israeli massacre of Gaza, four small boys ran for their lives across an empty Gaza beach as the Israeli navy chased them with shelling, eventually hitting their prey. 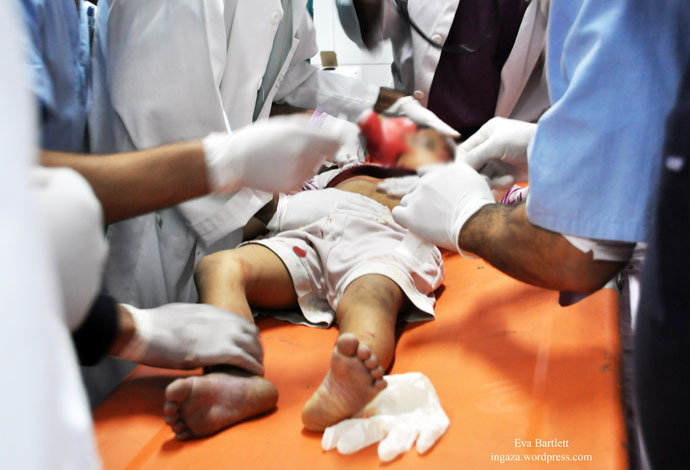 The shelling of the Bakr boys, aged nine to 11, was recorded by a number of Palestinian and foreign journalists camped out at the nearby Deira hotel, many of whom broke down at witnessing this savagery. The assault on Palestinian children is, of course, not merely limited to its times of bombing Gaza. Almost daily in Gaza’s border regions and on the sea, children are machine-gunned and shelled by the genocidal bully of the region, under the pretext of “security.” Having witnessed this on countless occasions, myself under fire with the brave farmers, I can say one hundred percent affirmatively that they posed no security threat to the well-armed Israeli army (nor navy). In the rest of occupied Palestine, whether during the criminal routine Israeli army invasions and lock-downs of West Bank and Jerusalem areas, or during demonstrations against the illegal Wall stealing yet more Palestinian land, or merely randomly, Palestinian children are targeted by Israeli live ammunition, tear gas canisters, and hands-on brutality, not only by the so-called “most morale army” but also the unspoken of proxy soldiers: those vile, racist, illegal Jewish colonists who (claiming God’s approval) abuse Palestinians of all ages, without consequences. Throughout the West Bank and Jerusalem, Jewish colonists routinely run over Palestinian children. Two examples include an October 2014 hit and run near Ramallah of two 5 year old Palestinian girls, one of whom—Inas Shawkat Khalil—died from her injuries. They further note that most Israeli-imprisoned Palestinian children are nabbed in the middle of the night, something youths from Resistance villages like Bil’in are well-familiar with. Bil’in, known for its popular demonstrations against the illegal, land-grabbing Wall, has lost many a martyr, including children to Israel’s brutal attempts at stifling dissent (On that note: to all the media that leapt on the false, “Bashar is killing unarmed protesters band-wagon,” Israel is actually doing so). That the UN is even considering not including Israel on the list speaks further volumes to the uselessness of this institution, a body that serves only to put the odd band-aid on the seeping Palestinian wound and to endorse criminal bombings of sovereign nations. In any case, Israel need not worry that anyone is trying to “besmirch” its reputation. It has proven quite adept at doing that all on its own. Every blown-off Palestinian child’s head, every Palestinian child behind Israeli bars, every Mohammed Abu Khdair tortured and killed by Jewish colonists, and every colonists’ intentional running over of Palestinian children “besmirches” what is left of the racist, genocidal state’s reputation, with or without UN recognition. June 5, 2015 in Israel, Palestine. ← Reflections on Arsal & Syrian refugees in Lebanon by a correspondent based in Syria.